Originally from Texas, Lisa's road to Tofino has followed many trails including a number of years in New York, studying at the CIA, the Culinary Institute of America. After graduating with honours from cia and spending some time creating beautiful food for others Lisa felt that it was time for a change. Inspired from an article years past, Lisa visited Vancouver Island and fell in love with it's natural wonders. That was the beginning of SoBo. I've always tweaked this recipe according to what fish is readily available: in New York I used snapper and in Texas I used bass. Here in B.C., salmon and halibut have become my all-time favourites. Don't be a slave to the recipe; buy what's fresh and nice. The salsa should reflect the season; in the summer I use peaches and blueberries, in autumn pears and apples, in winter pineapples. I love to pair these tacos with a lovely bed of greens with just a little olive oil and lime juice. Serving them with traditional Mexican beans and rice is wonderful as well - or simply in the hand alone is refreshing. Dice the red onion and puree or finely chop the chipotles. Dice the fish into 1-inch pieces. Pat fish dry and season with kosher salt. Heat oil in a large nonstick skillet over moderate-high heat. Add the onions and saute them for 1 minute; add the fish and fry for about 3 minutes until just cooked. Add the chipotle chiles, stir for 1 more minute and remove from heat. Fill taco shells halfway with fish mixture, then top with fruit salsa. Prepare the fruit salsa by dicing the ingredients small enough to fit into a prepared taco shell — smaller than a fruit salad, but not so small that the fruit turns to mush. Combine the fruit, avocado and cilantro. Refrigerate until ready to use. The holding time is about 24 hours as the fruit starts to break down. Also note that if you intend to prepare the salsa in advance, don't add the avocado until immediately before serving, as avocado turns brown quickly. 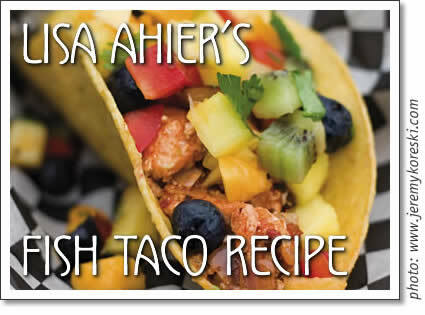 Lisa Ahier shares her famous Killer Fish Taco recipe, one of the signature dishes of SoBo in Tofino.